A fair play line will be drawn and will run from foul line to foul line 8 feet from the tip of home plate. The pitcher will throw from a pitching rubber which will be 43 (38 for the senior and lady tournaments) feet from the tip of home plate. Paint will be used for foul lines and field zone lines. 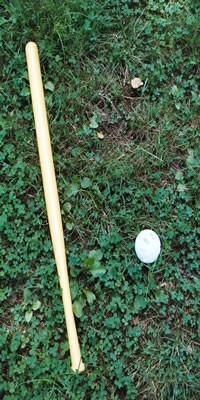 Only the white baseball size Wiffle®Ball, (eight slots on one side) provided by the tournament will be used for play. The only other modification to the surface of the ball will be that resulting from normal play. If a ball is torn more than 1/4 inch it will be ruled illegal for play and will be removed from the game. A team's roster will consist of maximum of three players. Only two players on the field, pitcher & fielder. A batting order will be set at the beginning of the game and cannot be changed during the game. If a team bats out of order that batter is ruled out. The batter that made the last out in the previous inning will hit second in the next inning. (If a team has three players, only the two who are fielding will be batting) If a three person team substitutes a player, the removed player may reenter the game, as long as the person he subs for has pitched one inning. In essence, anyone who plays must pitch an inning. Five innings equal a normal game. A mercy rule is in place if a team has a lead of 20 after three innings or 10 after four innings. There will be no mercy in the championship games. Three outs per inning for each team. A batter will begin with a count of one strike and one ball (1 and 1). Three balls to a walk and two strikes is an out (because you start 1 and 1). A batter can stay alive forever on foul balls. Hopefully, if a pitch is close, people will be swinging. A backstop made out of plywood with holes will serve as the strike zone. The zone will be no less than 20 inches wide and 30 inches high. Strike zones will start at no less than 10 inches above the ground and no more than 12 inches above the ground. In extra innings, both teams will begin the inning with the bases loaded. This format begins immediately after 5 regular innings. Two pitchers from each team will rotate back and forth in extra innings. All batted balls must reach the fair play line to be playable; otherwise it is a foul ball. If a ball reaches the fair play line and is not fielded it will be ruled a foul ball if it does not reach the single line. Any ball that hits the ground beyond the fair play line (8 feet) and spins backward to in front of the line is a foul ball and will be ruled a strike. A ball hit that does not reach the fair play line is ruled foul. If a ball hits passed the fair play line and bounces back before being touched, it is a foul ball. A ground ball fielded before rolling past the DOUBLE line is an out. If a ground ball is dropped by a fielder, in front of the single line (43 feet) and the ball falls on the ground, it will be ruled a single. A player's position to the infield line does not matter, the ball is the key, it must land past the line to be ruled a hit. If the ball touches the fair play line and is caught, it is still an out. If a batted ground ball is dropped by a fielder and the ball falls on the ground, it will be ruled a hit and one base will be awarded. If a batted fly ball is dropped by a fielder and the ball falls to the ground, it will be ruled a hit and bases will be awarded based upon where the ball falls. If the ball is initially touched in fair territory, the ball is considered fair, even if it is dropped in foul territory. Any ball that initially touches beyond the infield line in foul territory is a foul ball, even if it bounces back into fair territory. *****Ground balls that hit the ground before the infield line are singles no matter how far they roll, and can only be fielded for outs in front of the DOUBLE line. Any fair ball that goes past the doubles line on the fly will be ruled a double. Any fair ball that goes past the triples line or hits the fence without going over on the fly shall be ruled a triple. A fly ball hitting the outfield wall first and then being caught by a fielder is ruled a triple. A fly ball clearing the wall or fence is a home run. If a fielder touches a fly ball, and the ball goes over the wall it will be ruled a home run. A fly ball hitting the top of the wall and continuing over the wall will be a ruled home run. A fly ball hitting the foul pole above the wall is a home run. In tournament situations, any other field’s fair territory shall be considered out of play. A fielder can catch a foul ball with both feet in play. If both feet are not in play, than the ball shall be ruled out of play, and no out shall be recorded. A batter MUST move out of the way of any pitched ball with potential to hit the strike target. Subsequent violations may result in a called strike. Any batter moving into a pitch will have the pitch called a strike. Balls knocked out of the air or blocked from crossing the infield are singles as long as the fielder does the blocking from in front of the infield line. All base runners are ghost runners. There is no running by players when batting. Base runners move as follows: One base on a single, and two bases on a double. Runners need to be forced. For example, a single with a runner on third does not score a run. Example: A double with a runner on second doesn't score a run. You would have runners on second and third. A double with runners on second and third would score one run, and there would still be runners on second and third. On ground outs, the lead runner is always forced out. No other runners shall advance. *******With a runner on third base and less than two outs, a team may try and score the runner on third base on a fly ball. When the ball is in the air the offensive team can yell, "TAG" to activate the runner (while the ball is in the air). The fielder must catch the ball and throw home attempting to hit the backstop in the air. If the throw hits the backstop the runner is out, if it misses, the runner scores. All other base runners advance one base if the defensive player attempts to throw out the runner tagging up. The defensive team may choose not to contest the runner and keep all other base runners from advancing. The fielder should make the throw within two seconds. The batter may switch sides at any time in the count. The batter must notify the pitcher before doing so and may not switch sides during the delivery of a pitch, if so, the pitch will be ruled a strike. Once the batter has legally positioned himself, he is NOT required to move out of the path of the pitch. However, if the batter is ruled by the pitcher to have intentionally moved into the path of the pitch (leaning in) in an attempt to block the pitch from going through the strike zone, he shall be called for batter's interference, and the pitch will be called a strike. A warning must be given first, the warning remains with that particular batter for the remainder of the game. There is no hit batsman rule. A ball that hits the batter will be ruled a ball and no base will be awarded. The hands of the batter are considered part of the bat. A ball hitting the batter's hand(s) s and landing in foul territory is ONLY a strike if the batter is in the act if swinging, if not the pitch is ruled a ball. If a ball hits the bat when the batter is not in the act of swinging the pitch is ruled a ball. If a batter checks his swing, and the ball hits the bat, the pitch will be ruled a strike. A ball that a hit anywhere on the target (except for the legs) is ruled a strike. Each team player must pitch one complete inning. A pitcher must start his wind-up from the mound. Each team member must pitch one complete inning. The player that starts the inning must finish the inning. No substituting of pitchers during an inning. A pitcher will get ten warm-up pitches before the start of the game once he takes the mound and five between innings. If a relief pitcher comes into the game due to a result of an injury to the active pitcher, a reasonable amount of time will be allowed for the relief pitcher to warm-up. One pitcher cannot pitch four innings. For a team of two one pitcher would pitch three innings while the other pitches two. REMEMBER THIS IS A FUN TOURNAMENT: WORK TOGETHER AND HAVE FUN! FAIR AND FOUL CALLS: Will be the responsibility of the batter because he is looking down both foul lines. LINE CALLS: (Single, Double, Home Run) Will be made by the fielder closest to the ball because he has the best view of the play. CHECK SWINGS: Will be the responsibility of the batter. BATTER'S INTERFERENCE: Will be the responsibility of the pitcher. OFFICIAL SCORE: Remind each other of the score between every inning and at bat. The tournament will be double elimination throughout the entire schedule. An undefeated team must lose TWICE to be eliminated. Teams that lose their first two games will play in the toilet bowl tournament. Tournament Director will make ALL final decisions relevant to tournament play. Rules not stated herein, will follow the rules in accordance with Major League Baseball. There is absolutely NO refund on tournament fees once a team is registered. Once a schedule is made, there will be absolutely NO changes in game times. Games will be played in all weather conditions. Each participant can choose his own bat. An out is anything that is swung at that is not a dinger. All dingers count as one point. The top two individuals will advance to the finals. Each participant in the finals will get five outs. There is a prize for the winner.